PEROU – Pisquillo-Las Shicras - Archaeologists in Peru announced the discovery of the 500-year-old mummified remains of a woman from the pre-Columbian Chancay Culture (1100-1450 AD). The woman, whose age has yet to be determined, was wrapped in one of the three funerary bundles recently discovered at the Pisquillo-Las Shicras site in the coastal province of Huaral, 90 km north of Lima. Walter Tosso, who is heading the team of archaeologists excavating at the site, said the woman was likely a member of the culture’s more prestigious ranks. "She was not a simple villager," Tosso was quoted as saying by Peruthisweek.com. The specialists will work on the funerary bundle, which is wrapped with several layers of fabric, and as well as on two other funerary remains, that were wrapped with fewer fabrics. The study, specialists said, would provide valuable information about the Chancay, as well as shed light on their burial process. It will be the first time archeologists will carry out this procedure. There are several Chancay fabrics in museums and collections, but so far there are no details about how the Chancay used them in burials, the regional government said. 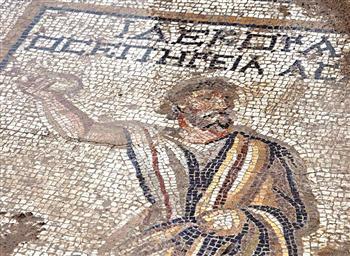 TURQUIE – Tarsus - A mosaic from the second or third century with a human figure has been found during the construction of a district bazaar area in the southern province of Mersin’s Tarsus district. Tarsus Gov. Orhan Şefik Güldibi said the mosaic was unearthed by chance in the construction area. “Maybe we have reached one of the most important archaeological remains in Tarsus. We know that the history of Tarsus dates back to ancient ages. We have found Orpheus mosaics on the ancient Roman road next to the courthouse. It shows us the richness of the district’s archaeological treasures,” he said. After unearthing the mosaic, construction work was halted and scientific work was initiated. The district governor said that there was a structure 25 meters by five meters in the area they thought could be a water cistern from the early Roman period. “This structure may also be the remains of a bath, palace or villa. We will see after the examinations. The human mosaic has Greek writing on it, which will be translated by experts. We think there are other mosaics around this one. We will restore and display it,” Güldibi said. TURQUIE – Istanbul - The controversial project to renew Istanbul’s Taksim Square could take more time than the planned eight months as the excavation will be done under the strict supervision of officials from the Istanbul Archaeology Museum. According to the decision of the board, construction equipment will not be allowed to work until all the archaeologists’ excavation work is completely finished. Construction company officials said they were surprised, and they had initially thought a museum official would supervise the excavation as heavy construction machinery operated. The museum archives specify that there were cultural assets found at Cumhuriyet Avenue and in its vicinity. At the parking lot behind the water storage tank, there were Genoese tombs found in excavations done in 2000 and 2001. The archaeologists believe that these tombs continue toward the planned road and the military barracks. On the other hand, they point out that sarcophaguses from the fifth century were found when the Atatürk Cultural Center was built. This meant, the archaeologists believe, that there was a settlement in that area and that a delicate archaeological survey is required during the tunnel construction. ROYAUME UNI – Liverpool - Joseph Williamson was an intriguing fellow. Born into poverty in 1769 he picked himself up by his bootstraps, set off to Liverpool to seek his fortune, donned a pink suit to marry a wealthy tobacconist's daughter and then, for reasons only known to himself, set about digging a series of tunnels the purpose of which remain, to this day, a total mystery. "There are two theories," Gordon Hunter, chairman of the Friends of the Williamson Tunnels, tells me, "that he had them dug to keep men returning from the Napoleonic Wars occupied, or that his wife came under the influence of a lunatic preacher who told her the apocalypse was coming and she persuaded Joseph to prepare chambers for underground living." until just over a decade ago, the Williamson Tunnels were regarded as something of a myth. Everybody had heard of them but nobody believed they existed. But a chanced-upon article, written in 1925, lit the fire of curiosity once more. "A man called Charles Hand found the entrance to one of the tunnels," Gordon explains, "and he wrote that he was able to walk underground for over a mile. We've only scratched the surface," he says, gesturing down into a hole I am about to descend in Edge Hill. "We think there are three layers of tunnels. At least." Currently there are two excavation points. "There are narrow tunnels," Les explains, "some no wider than a metre, but then suddenly, they open out into massive spaces. It's magical." USA – McGrath - The skeletons of three centuries-old Alaska Natives discovered in McGrath last month likely lived and died before Caucasians ever made contact, archaeologists say. A worker clearing Native corporation land to make a gravel-storage site in the Interior Alaska town found a skull in early October. In the silty, sandy ground, an archaeologist and McGrath's local Alaska State Trooper carefully uncovered the bones of three males: an adult, a younger adult and a child. Their first estimates in October put the bones at between 100 and 1,000 years old, archaeologist Joan Dale said. But more recent analysis of charcoal buried just above one of the skeletons has been dated to between 1470 and 1650 A.D., making the bones at least 362 to 542 years old -- if not older, said Vicki Otte, chief executive officer of MTNT. Otte announced the results of the radiocarbon dating at a community meeting and potluck in McGrath on Wednesday. The charcoal came from a fire hearth about eight inches above the skeletons, and melted animal fat and other material in the old hearth likely helped preserve the bones, said Dale, the archaeologist. Ancestral remains in any condition are rare for that part of Interior because of the acidic soil, let alone such well-preserved remains, she said. For example, the nearly complete sets of teeth recovered showed the early Alaskans had good dental health, said Betty Magnuson, first chief of the McGrath Native Village Council. McGrath residents viewing the bones Wednesday were surprised by that, Magnuson said. "The young people couldn't believe the condition of their teeth, these beautiful teeth," she said. "Vicki looked at them and said, 'That was before sugar.' "